Well, like previous years, some sponsors are putting up their Super Bowl ads online. That means non-football fans don't need to worry about tuning in to the game if you want to check it out. Aside from that, there's the product TV commercials. I've skipped a few and included the more interesting ones that got my attention, and kept it, after the ad ended. I also skipped the ads for products that had more ads in the YouTube video itself. That seemed self-deprecating to have ads in ads. I also skipped the teasers for these teasers or trailers. I have a short tolerance for that. It could become an endless cycle if we're not careful. Cute, not over the top though. 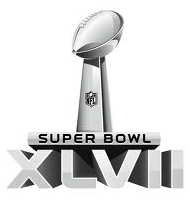 Volkswagen Super Bowl 2013 Game Day Commercial | Get In. Get Happy. ALL Finalists... (AKA, Long commercial set) First ad starts around the 2 minute mark. I got a kick out of the goat piece, and the "wedding dress" bit. "Fetch" is cute.